The authority may either of its own motion or on a complaint or request made to it by any person, any organization of consumers or an association of traders. 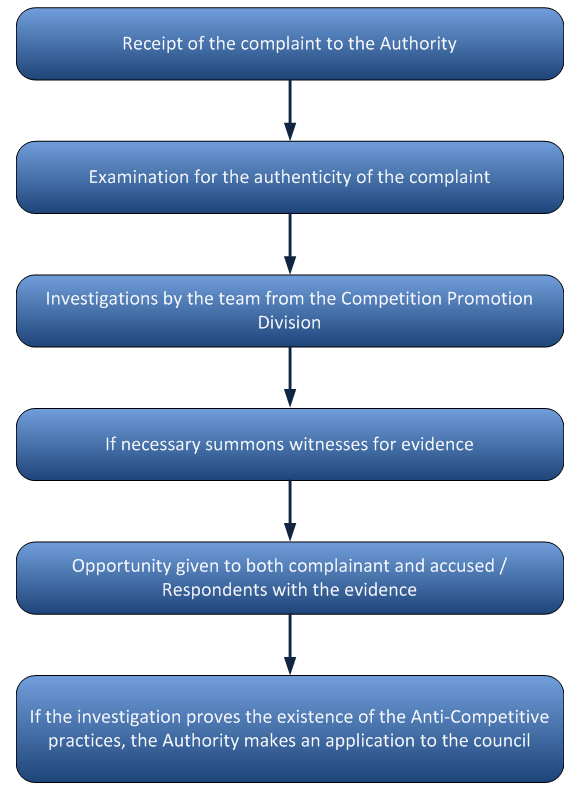 Carry out an investigation with respect to the prevalence of any anti-competitive practices. It shall be the duty of the Authority to complete an investigation under subsection (1) within one hundred days of its initiation. For the purpose of section 34, an anti-competitive practice shall be deemed to prevail, where a person in the course of business, pursues a course of conduct which of itself or when taken together with a course of conduct pursued by person associated with him, has or is intended to have or is likely to have the effect of restricting, distorting or preventing competition in connection with the production, supply or acquisition of goods in Sri Lanka or the supply or securing of services in Sri Lanka. Consumer Affairs Authority is empowered by Section 34 of the Act No. 09 of 2003 to carry out investigation with respect to the prevalence of anti- competitive practice. 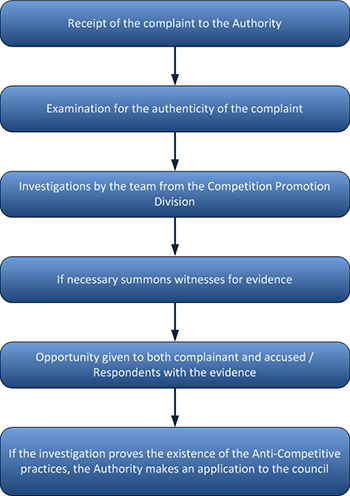 The CAA invites representations where a person in the course of business, pursues a course of conduct which of itself or when taken together with a course of conduct pursued by persons associated with him, has or is intended to have or is likely to have the effect of restricting, distorting or preventing competition in connection with the production, supply or acquisition of goods in Sri Lanka or the supply or securing of services in Sri Lanka .Where the anti competition situation in question may operate against the public interest, any association, business concern or person interested may make representations in this connection to the CAA. Where the application is made to the Council as the case may be, it shall be the duty of the Council to make its order in respect of anti-competitive practices on the parties concerned for the termination of such anti-competitive practices if it is against the PUBLIC INTEREST on such application after an inquiry. For the purpose of investigations the Authority has the powers of a District Court. The Compliance & Enforcement division is the legal arm of the authority & is mainly responsible for the enforcement of the provisions of the Consumer Affairs Authority Act no.09 of 2003 some of the functions of the division are given below. Conducting of inquiries on consumer complaints in terms of sections 13(3) and 32(4) of the act and the enforcement of orders issued in respect of such inquiries through the judiciary. Institution of action in courts and prosecution of offenders for the contravention of the provisions of provisions of the act and depending the Authority in courts on cases instituted against the Authority. Preparation, Execution, and enforcement of agreements on behalf of the Authority as per the provisions of the Act. Drafting and publishing of directions and orders in the government Gazette in terms of the provisions of the Act. Preparation and issuing of Warnings to Traders in terms of the provisions of the Act in the case of first contravention of the provisions. Monitoring of substandard goods entering the country with the assistance of the SLSI and Sri Lanka Customs. Organize and conduct legal educational programs for the operational staff in order to enhance their knowledge & participation as resource persons on educational/awareness programs for both consumers and traders conducted by the Authority and Other Organizations. Apart from the day to day activities, the division is responsible for drafting and preparation of proposals to amend the existing provisions in the act in order to enhance powers of the Authority and to minimize the barriers in the implementations of provisions. In achieving this task the division is involved in obtaining proposals, drafting and liaising with the respective Departments [Attorney General’s Department and the legal Draftsman’s Department] in sorting out varies issues. Handing of consumer complaints including the negotiations for settlements with a view of granting redress to the aggrieved complaints in a manner acceptable to both parties. Coordinate with other Regulatory bodies in obtaining redress for aggrieved consumers, especially in respect of services.